If you prefer not to smoke weed and you’re curious about the soaring popularity of edibles, then this pot brownie recipe is exactly what you need. First, you need to apply heat to the cannabis so that the THC is fully activated. Heat your oven to 240 degrees and then place your cannabis in one layer. Use a baking sheet with sides. The baking time is around 40 minutes and you’ll need to turn the sheet several times so that the heat is evenly distributed. When it’s almost ready, your cannabis will become dry. Next, bring to boil a quart of water in a medium sized saucepan. Make sure the marijuana is floating no more than 2 inches from the pan’s bottom, or at least 1.5 inches. Place the butter into the pan when the water starts to boil and allow it to melt entirely. You can use 3-4 sticks of butter for every ounce of weed. Add marijuana when the butter has fully melted and turn down the heat to a simmer. Let it cook for about 3 hours or until the mixture becomes thick and glossy. Use a bowl to hold the product and place a double layer of cheesecloth over it. I recommend that you secure it with a string, tape or elastic. Then strain the butter until the saucepan is empty. Pick up the cheesecloth and squeeze all the butter that’s left inside. Let the butter cool for 1 hour and place inside the fridge until it solidifies. Finally, run a knife along the edges and lift off the butter. Place it upside down and remove any cooking liquid. Now that you have cannabutter, let’s begin making your brownies. Make sure you get the right dose to avoid nasty side effects. 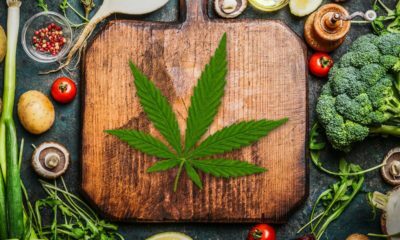 There’s a formula for this but if you want to do away with the Math, you can use an online calculator to determine how many mg of THC for every serving. Here’s a simple recipe you can use which is good for 24 servings. The preparation time is 15 minutes and if you want to add frosting, it will require another 15 minutes. Cooking time is around 30 minutes. First, preheat the oven to 340F. Grease lightly a 9×13 inch brownie pan. In a bowl, combine cannabutter, water and eggs. Add the brownie mixture until fully blended and add chocolate chips and pecans. Check the box instructions for how long to bake the brownies or insert a toothpick and check if it comes out clean. Take out the pan and let it cool for half an hour. If you want to add frosting, melt the chocolate in a microwave for 20 seconds and stir. Then microwave for another 10 seconds. Dip each brownie in the chocolate mixture. Then sprinkle the crumbles of the health bar on the brownies. That’s it. 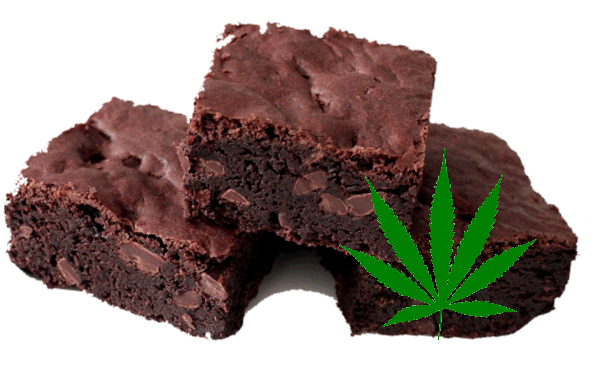 You now have a batch of rich and delicious weed brownies for you to enjoy!